Governments are failing to invest in education in a coherent and thoughtful way. New analysis by Mitchell Institute at Victoria University reveals a decade of ad hoc, piecemeal spending across Australia's education system. Mitchell Institute Director, Megan O'Connell said their latest education expenditure report shows governments ignoring expert warnings and refusing to look at education as a cohesive, integrated system. "Governments need to look at all stages of education together when considering reforms, but the figures show that this is not happening," Ms O'Connell said. "We're most concerned about the tertiary sector, where there is growing disparity between universities and Vocational Education and Training (VET). "Last year we reported that VET expenditure had plummeted to its lowest point in ten years – well this year it has dropped even further. "We could be setting up a very uncertain future for Australia, since many predicted growth areas for jobs require vocational qualifications. "It is staggering that despite all the evidence for a strong VET system, governments still treat it as the poor cousin of universities. We are ignoring the critical role VET plays in preparing people for careers and contributing to our nation's prosperity." To see the full picture of public investment in education, student loan programs need to be taken into account – these figures show that changes to VET funding have resulted in students carrying more costs. In higher education, expenditure growth is slowing – perhaps suggesting an end to the strong climb that followed the uncapping of places. Schools experienced increased expenditure, largely mirroring operational growth in the sector. 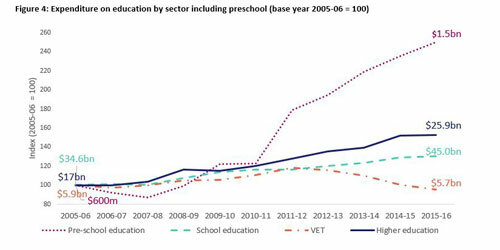 Preschool expenditure grew the fastest over the eleven-year period, although this was from a significantly lower base. Ms O'Connell said this fourth report in Mitchell Institute's education expenditure series adds further evidence for governments to substantially rethink their education investment approaches. "The longer we lack coherent education policies, the longer we miss out on the benefits that an integrated education and training system can deliver for young people, communities and our economy. "It is time to put an end to disjointed approaches to investing in our nation's future." Expenditure on education and training in Australia brings together data across all areas of education, serving as annual prompt for governments to consider a more planned and consistent approach to distributing resources. The series is available online at www.mitchellinstitute.org.au.